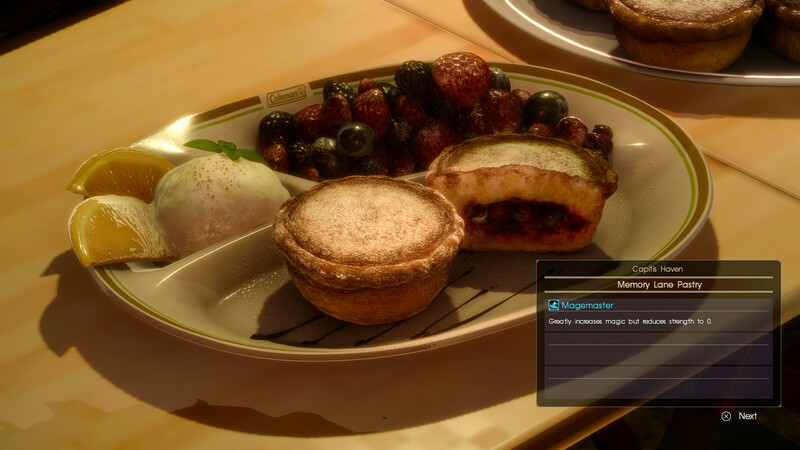 Dishes or Recipes are Items in Final Fantasy XV that can be prepared at Camps. They provide different benefits to the party depending on what they are, and are prepared using Ingredients acquired during the game. Veggie Medley Stew Level 2: Attack Boost, increases attack by 20. Level 3: HP Boost, increases max HP by 150. Battered Barramundi Attack Boost (Level 10): Increases attack by 100. Crown City Dive-Style Dumplings Attack Boost (Level 10): Increases attack by 100. Magic Boost (Level 10): Increases magic by 100. Read one of the Orienteering Checkpoints (B Poster) in the tunnel that's south of the Norduscaen Blockade, also part of the Ever Regal Regalia quest. Sweet and Spicy Cygillan Crab Attack Boost (level 10): Increases attack by 100. HP Boost (Level 4): Increases maximum HP by 200. Flameproof (Level 7): Increases fire resistance by 70. Paella de Pollo Attack Boost (Level 15): Increases attack by 150. Hunters' Krazy Kebabs Attack Boost (Level 20): Increases attack by 200. Three-Mushroom Kebabs Attack Boost (Level 15): Increases attack by 150. Green Soup Curry Attack Boost (Level 16): Increases attack by 160. Fire-Sauce Fillet Attack Boost (Level 20): Increases attack by 200. Read one of the Orienteering Checkpoints (A Poster) located at Coernix Station - Alstor, found on the door of an abandoned shack past the gas station. Karlabos Cream Croquettes Attack Boost (Level 20): Increases attack by 200. Regen Boost (Level 2): Accelerates HP recovery rate y 50%. Taelpar Harvest Galette Magic Boost (Level 12): Increases magic by 120. Spirit Boost (Level 8): Increases spirit by 400. HP Boost (Level 20): Increases HP by 1,000. Purchase the book Iron Shelf Recipes, Vol. 3 from the Burbost Souvenir Emporium. Sweet Saltwater Crustacean Curry Attack Boost (Level 12): Increases attack by 120. Fishsticks on Sticks HP Boost (Level 20): Increases maximum HP by 1,000. Sea Bass Saute HP Boost (Level 30): Increases maximum HP by 1,500. Anointed Allural Sea Bass Attack Boost (Level 20): Increases attack by 200. Acquire a Allural Sea Bass Fillet. Marrowshroom Chowder Clairvoyant: Increases HP recovery by 150%. Purchase the Iron Shelf Recipes, Vol. 5 from Old Gobunat's Boat in Altissia. Smoked Behemoth Attack Boost (Level 40): Increases attack by 400. Endurance: Enables sprinting without expending stamina. Tide Grouper Carpaccio Attack Boost (Level 30): Increases attack by 300. Eat the Fettini di Cernia at the Maagho in Altissia. Lasagna al Forno HP Boost (Level 80): Increases maximum HP by 4,000. Clairvoyant: HP recovery is increased by 150%. Seasoned Midgardsormr Equalizer: Increases damage dealt based on the level difference between the party and enemies. Attack Boost (Level 35): Increases attack by 350. Fried Tide Grouper Attack Boost (Level 50): Increases attack by 500. Roc of Ravatogh Rice Attack Boost (Level 30): Increases attack by 300. Eat the dish you unlock from the Berried Memories side quest. King's Stew Attack Boost (Level 40): Increases attack by 400. Crispy Zu Skewers HP Boost (Level 40): Increases maximum HP by 2,000. Critical Hit Rate Bonuses: Increases critical hit rate by 80%. Obtain a Zu Tender by killing Zu in The Rock of Ravatogh. Kenny's Secret Recipe Attack Boost (Level 40): Increases attack by 400. Prime: Boosts all stats and EXP gains by 50%. 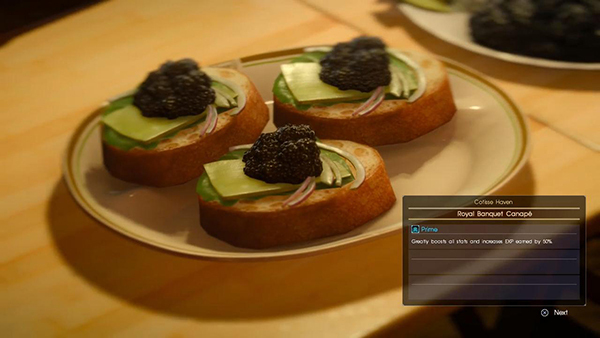 Eat the Fine Caviar Canape at the Maagho in Altissia. Cup Noodles Attack Boost (Level 3): Increases attack by 30. EXP Boost (Level 2): Increases experience points earned by 20%. Encounter the Cup Noodle truck at Lestallum. Defense Boost (Level 25): Increases defense by 250. Spirit Boost (Level 40): Increases spirit by 400. HP Recovery (Level 2): Increases HP recovery by 50%. Reading the Iron Shelf Recipes, Vol. 2. That book can be purchased at the Wiz Chocobo Post. Garulessandwich Attack Boost (Level 12): Increases attack by 120. Horntooth Meat Pie Attack Boost (Level 16): Increases attack by 160. See a hunter eating at the Meldacio Hunter HQ. Beanball Croquettes HP Boost (Level 10): Increases maximum HP by 500. Finding the Orienteering Checkpoints (D Poster) at the Alpine Stable parking lot north of Lestallum, in a ruined building on the right side of the road past an old barn. Golden Egg Galette Attack Boost (Level 12): Increases attack by 120. Reading the Orienteering Checkpoints (E Poster) at the Cape Caem Outpost in southern Cleigne, on the path up to the lighthouse. Tomalley-Filled Dumplings Attack Boost (Level 10): Increases attack by 100. Fluffy Chiffon Cake Defense Boost (Level 20): Increases defense by 200. Cannedwich Attack Boost (Level 10): Increases attack by 100. You need to see a woman eating at the Hunter HQ Outpost. Garden Curry Attack Boost (Level 8): Increases attack by 80. Triple Truffle Risotto HP Boost (Level 8): Increases maximum HP by 400. Regen Boost (Level 3? ): Increases regeneration rate by 75%. Poisonproof: Immune to poison effects. Robust Bean Soup HP Boost (Level 12): Increases maximum HP by 600. HP Recovery (Level 2): Increases HP recovery rate by 50%. Meat-and-Beet Bouillon Attack Boost (Level 10): Increases attack by 100. Reading Oric's Culinary Chronicle Entry 3: New Friends at the Prarie Outpost in Leide, on a crate on the other side of the weapons truck. Creamy Milk Risotto HP Boost (Level 12): Increases maximum HP by 600. HP Recovery (Level 3): Increases HP recovery rate by 75%. Lestallum Stewed Tripe Magic Boost (Level 20): Increases magic by 200. Fried Rookie on Rice Attack Boost (Level 10): Increases attack by 100. HP Boost (Level 8): Increases maximum HP by 400. Read Oric's Culinary Chronicle Entry 2: An Egg Can Dream, that can be found in Lestallum, on a checkered table across the street from the Cup Noodles food truck. Toadsteak Drumsticks Attack Boost (Level 12): Increases attack by 120. Magic Boost (Level 20): Increases magic by 100. Meldacio Meat Pie Attack Boost (Level 15): Increases attack by 150. Nebula Salmon Teriyaki Attack Boost (Level 15): Increases attack by 150. Salmon-in-a-Suit Attack Boost (Level 12): Increases attack by 120. HP Boost (Level 14): Increases maximum HP by 700. Croaker in Brown Sauce Attack Boost (Level 15): Increases attack by 150. Skewered Wild Trout Attack Boost (Level 15): Increases attack by 150. Moist Tomato Cake Defense Boost (Level 20): Increases defense by 200. Crispy Fish Fritterwich Attack Boost (Level 16): Increases attack by 160. Darkshells Marienieres Attack Boost (Level 10): Increases attack by 100. Level 6: HP Boost +300. Eat Kenny's Salmon from a Crow's Nest Diner. Find a Dualhorn Steak and Leiden Pepper. Classic Tomato & Egg Stir-Fry Attack Boost (Level 10): Increases attack by 100. Dish and Chips HP Boost (Level 6): Increases maximum HP by 300. Order Kenny's Fries from a Crow's Nest Diner. Dry-Aged Tender Roast Stew Attack Boost (Level 8): Increases attack by 80. Find or purchase a Garula Sirloin. Fried Frontier Skewer HP Boost (Level 10): Increases maximum HP by 500. Peppery Daggerquill Rice Attack Boost (Level 8): Increases attack by 80. Regen Boost (Level 1): Accelerates HP recovery rate by 25%. Egg-Fried Crustacean Bowl Attack Boost (Level 10): Increases attack by 100. HP Boost level (Level 12): Increases maximum HP by 600. Catch a trevally (such as a Giant Trevally or Galdin Trevally) and acquire a Trevally Fillet. Charcuterie on Toast Attack Boost (Level 8): Increases attack by 80. Creamy Fowl Saute Attack Boost (Level 8): Increases attack by 80. Quillhorn Soup Attack Boost (Level 10): Increases attack by 100. Creamy Crustacean Omelette Attack Boost (Level 10): Increases attack by 100. Obtain a Shieldshears Claws by defeating a Shieldshear. Oil-Drizzled Steamed Fish Attack Boost (Level 6): Increases attack by 60. Magic Boost (Level 5): Increases magic by 50. Prairie-Style Skewers Attack Boost (Level 4): Increases attack by 40. HP Boost (Level 4): Increases HP by 200. Multi-Meat Sandwich HP Boost (Level 2): Increases maximum HP by 100. Grease Monkey's Schnitzel Sandwich Attack Boost (Level 8): Increases attack by 80. Go to the diner in Hammerhead and have the Hammerhead Hot Sandwich. To have that sandwich available from Takka, you need to complete his third mission, Emergency Delivery. See a woman at Overlook in Lestallum eating. The recipe is found on a barrel inside a shack west of three valley parking spot. Find the Oric's Culinary Chronicles Entry 8: The Hero of Saxham book.